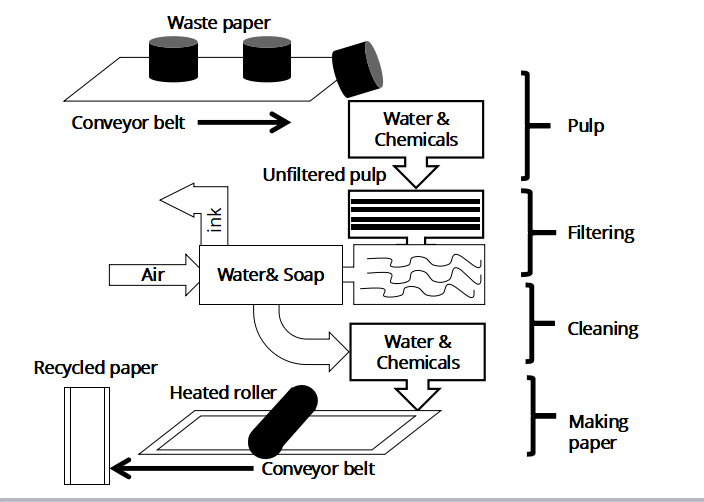 Given is a process chart illustrating materials and equipment used in four consecutive steps consisted in the manufacture of recycled paper. First of all, shredded paper collected in tubs will be placed on a conveyor belt which transfers it to a container. Once the waste paper scraps are poured down, they are immersed in water and chemicals to breakdown the paper fiber materials. It turns the paper materials into a slurry substance, a process termed as pulping. When pulp is produced it is then passed through a series of screens. After the filtering process, the next process involves putting the clean and homogeneous pulp in a blender made up of water and soap to enhance purity. At this point, air will be infused while ink will be discharged by a tube. The cleaned pulp will drain through a pipe into the last container to be submerged into water and chemicals, after which, it is put to dry on a flat conveyor belt and form long rolls of continuous sheets of paper. In brief, the whole recycling process for waste paper takes four steps involving pulping, filtering, cleaning and forming. Some businesses find that new employees who just finish their education lack basic interpersonal ability such as work with others as a part of team.What do you think the causes of this problem?And how to solve this? Despite the high level of knowledge, employers today have found that their new employees lack basic interpersonal skills needed in an office environment. This essay will analyze the main reason leading to the problem and offer some potential solutions to it. People with interpersonal skills are the people who can vary how they act and what they contribute. They notice the strengths and weaknesses of their group, and they adapt. However, schools and colleges or universities have failed to equip students with such applied skills. Instead, students are encouraged to focus on their academic subjects exclusively, because they are only evaluated by their academic performance which is essential to receiving an academic qualification. Unfortunately, many of them have turned into information recipients who acquire the knowledge in a passive way without truly developing abilities and skills required in today s job market. For high schools, educators should think more about how students are learning, rather than just what they are learning. Teaching should reflect the richness of real-life interactions, and to give students experience in the kinds of settings that are going to be useful to them when they leave school. Assignments and curricula should integrate opportunities to work collaboratively. Group projects, for example, are valuable learning opportunities. In the higher education sphere, professors and administrators should encourage students to seek out real-world experiences. Colleges and universities could ask students to work collaboratively in the classroom and pursue internships and volunteer opportunities outside of it. Students should also look for critical growth opportunities within their extracurricular activities, rather than just viewing them as resume-fillers. To conclude, jobs requiring high levels of social interaction are growing. In order to help graduates better prepare for their future career, changes should be considered in the education system.